A Chlorine Donor is a chlorine-rich compound when combined with a fuel within a pyrotechnic flame, certain colors can be produced or enriched. The following table can be used whenever we want to substitute one chlorine donor for another. 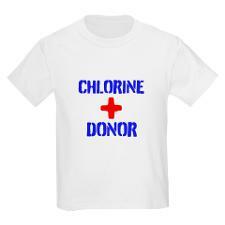 In this case we would use more of the weaker donor to account for the missing chlorine. Potassium chlorate can be considered to be somewhat of a chlorine donor during combustion, which allows free chlorine to combine with other elements in the colored flame. When potassium perchlorate or a nitrate is used as the oxidizer, some supplemental chlorine must be included in the composition. Parlon contains about 70 % chlorine, and PVC(Polyvinyl chloride) about 56 %. Parlon adds more chlorine to the mix and it gives a slightly better color. PVC is used mainly because it is readily available and cheap. Saran or PVDC (polyvinylidene chloride) powder would be the best choice if it were available. However, there are seemingly hundreds of different versions of "Saran", which are copolymers of PVDC with some other plastic, including PVC and acrylonitrile. When these copolymers are mostly not PVDC, the chlorine content is lowered and the burning characteristics become less desirable. A simple test for a given sample of Saran is to test for solubility in acetone or MEK. If the powder eventually dissolves at room temperature, it has a high copolymer component. If it does not dissolve, or requires high heat to dissolve, then it can be recommended for use in pyrotechnics. Similar to Saran in the aspect of identity crisis is Chlorowax. There are at least ten different Chlorowax compounds, which range from white powder to oily liquid. Also, these act as a binder and a chlorine donor, whereas Hexachloroethane and Hexachlorobenzene, Dechlorane can be used as a substitute for HCB, these only donate chlorine and a binder is required. Ammonium perchlorate is often used as an oxidizer and a chlorine donor simultaneously. Ammonium chloride can also be used, if the composition is compatible with it and a cool flame is desired. Acetone and Chloroform or MEK (methyl ethyl ketone) will dissolve Parlon very well up to a syrupy solution. Usually a 10 to 25 % solution is used as a binder. PVC can be dissolved into tetrahydrofuran up to 20 to 25 %. Powdered polymers (PVC mostly) can be used as such, mixed into the star mass, and moistened with the solvent. Parlon is chlorinated rubber, used in some lacquers and paints. Hexachloro- benzene and -ethane are more difficult to find, a chemical supplier might have them as reagents. Colorless PVC hose is a good source for pure (almost) PVC. This kind of a PVC contains plasticizers, but they do not matter at all. There are only some percent of them present. In fact, they only make the mass more strong mechanically, it is not brittle, but somewhat elastic. Hazards: Most of the chlorinated compounds mentioned in this article are suspected or known carcinogenic agents, due care should be taken when working with any chemicals, carcinogenic or otherwise.